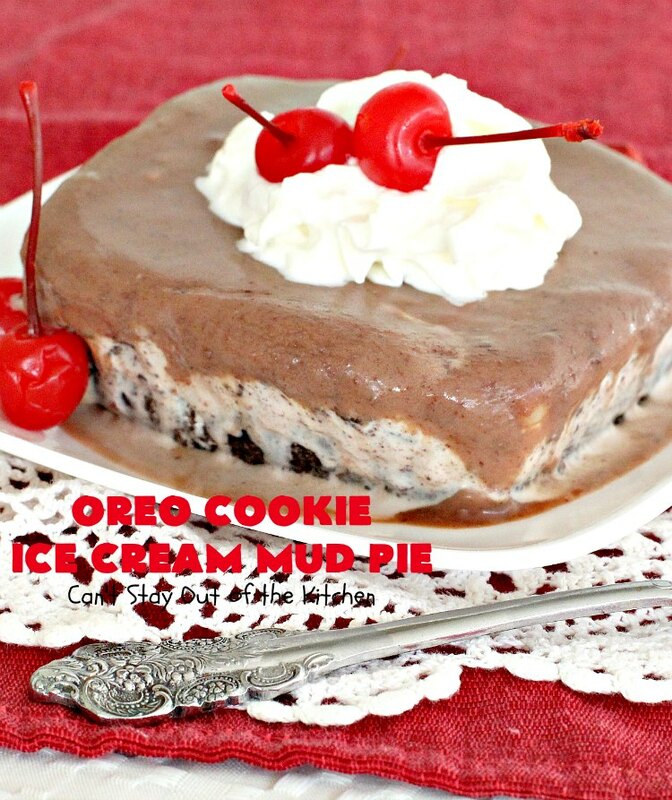 Oreo Cookie Ice Cream Mud Pie is a spectacular dessert! The flavors in this decadent ice cream dessert are amazing. It has an Oreo cookie crust. 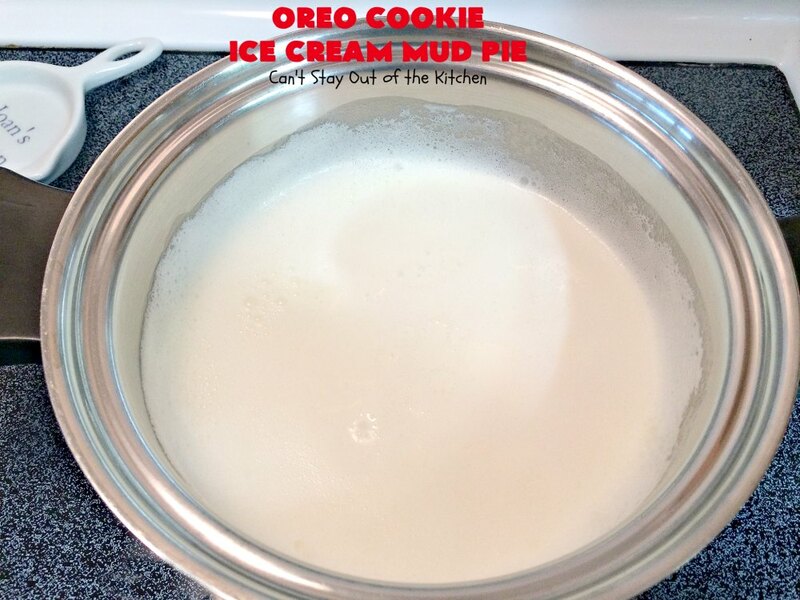 It’s topped with any flavor of ice cream–I used Oreo cookie ice cream, but you can use vanilla, rocky road, tin roof sundae or chocolate chip cookie dough. Then a delicious chocolate topping with Ghiardelli’s semi-sweet chocolate is spread on top. Wow! A-M-A-Z-I-N-G!!! I assure you, once you take one bite of this delicious dessert, it will be really hard to stop! It’s that good. I warn you in advance, don’t use any cheap substitutes–use real whipping cream, real butter, real dark chocolate, and real vanilla in this recipe or you’ll be sorry. Regular milk and margarine will never thicken enough. It’s just not one of those recipes that can be pared down without disastrous results! When I first made this dessert in September 2012 I was very new to the blogging world and food photography in particular. I had no idea how to take decent pictures, nor that your food needs to be displayed on white plates so that it will show up well. I was using a cheap iPhone 3 camera and I didn’t always wait for the camera to focus (since I didn’t know I needed to!) 🙁 Regardless, the pictures were deplorable. I recently remade this delicious dessert (December 2014) for my husband’s birthday when we spent time with his family over the holidays. 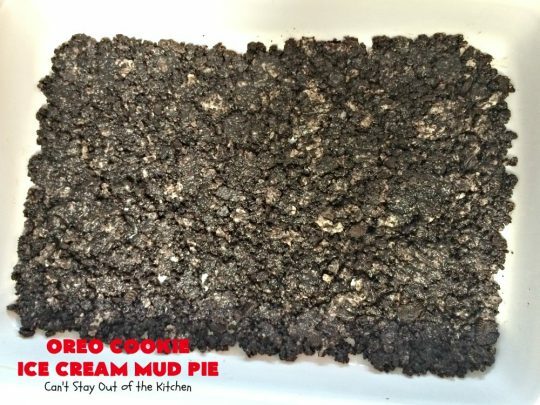 As a result of making Oreo Cookie Ice Cream Mud Pie again, I thought it would be helpful not only to provide better pictures but also some tips on what I’ve done throughout the years so this dessert comes out right. I’ve included those tips below and in the recipe card. Oreo Cookie Ice Cream Mud Pie is a lovely dessert but it is also a little bit of a “high maintenance” dessert. Let me offer some tips on making this scrumptious dessert so you don’t end up with a disaster. 1) If you use margarine or milk rather than real unsalted butter and heavy whipping cream, the sauce will not thicken the way it’s supposed to so it will turn out watery. Don’t use cheap substitutes. 2) It is imperative that you freeze each layer of the dessert before adding the next layer. (Freeze each layer uncovered). 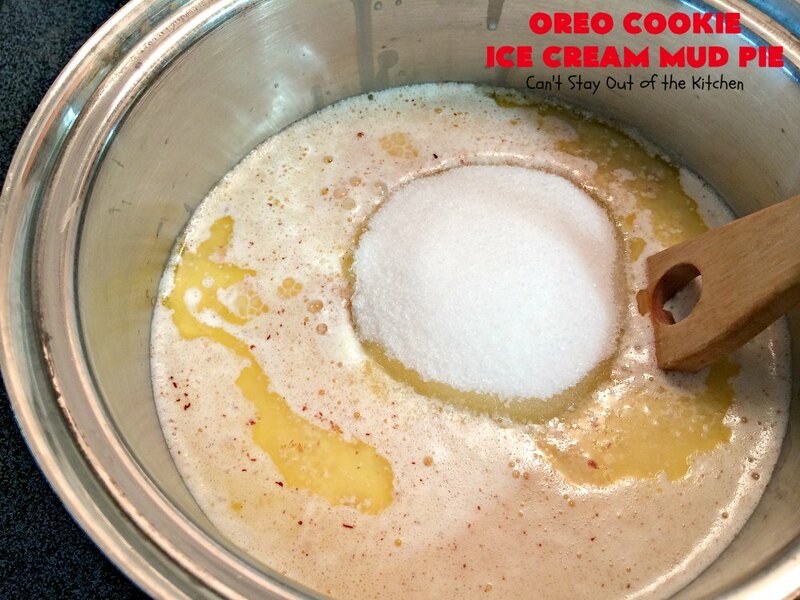 3) Freeze the Oreo cookie layer at least an hour. Freeze the Oreo ice cream layer at least two to three hours. Cool the sauce in the refrigerator (stirring occasionally) until it is really cold but still spreadable (not frozen), so that when you spread it over top of the ice cream, it will not melt the ice cream making blotchy bubbles all over the dessert. Freeze the dessert an additional couple of hours or overnight before serving. 4) Use a high quality chocolate to make the sauce. I used Ghirardelli. 5) Don’t be in a rush to get this dessert made. If you don’t have time to allow it to freeze between layers, make it for a time when you aren’t busy or plan ahead. This is fine making it a day or two before you need it. 5) Allow the top chocolate layer to freeze completely several hours before adding any kind of foil or wrap, or it will stick to the wrap and make a mess. 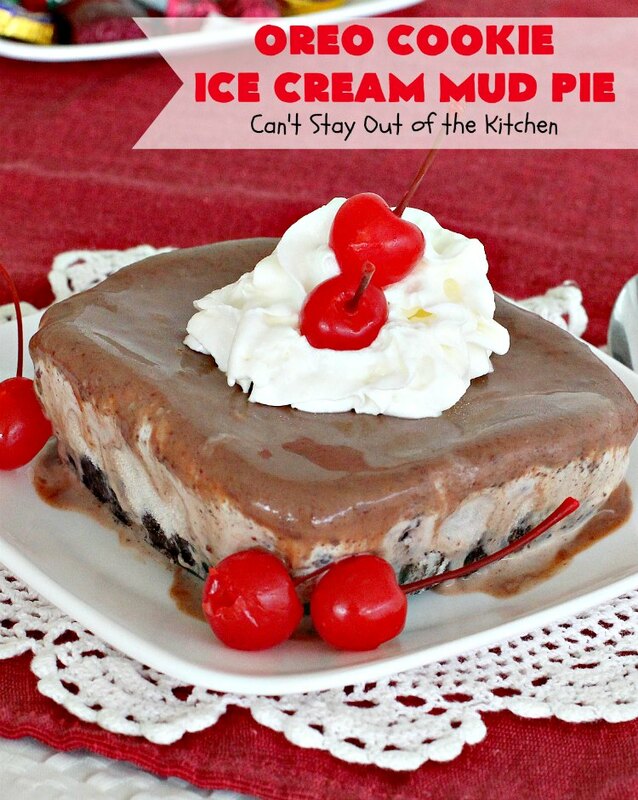 I recommend making this dessert in a deep dish pan so that when you are ready to put wrap over top it will not sink into the dessert and cause it to stick. Foil actually works better than plastic wrap for this dessert because it won’t sink into the topping. Trust me on this. There’s nothing worse than spending all your time making a dessert and then the plastic wrap sticks to the topping and ruins it so it doesn’t look pretty. You can also make this in a baking dish or pan that comes with a lid. 6) Do not cover the dessert while freezing each layer, until the finished dessert has been in the freezer for several hours. 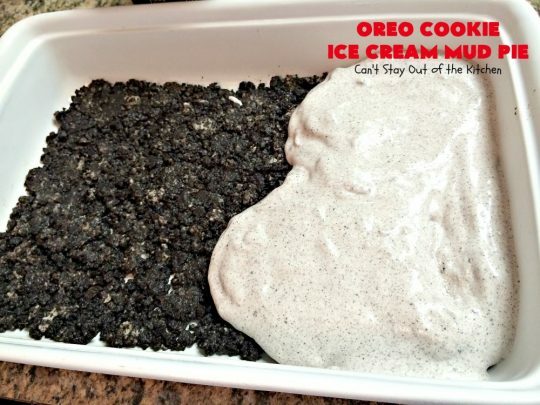 7) Grease your baking dish very generously before adding the Oreo cookie crumbs so the mixture will come out of the dish well and without sticking. 8) When making the sauce be very careful not to cook it higher than a low to a medium-low temperature or the chocolate will scorch and you will have to throw it out and start over! 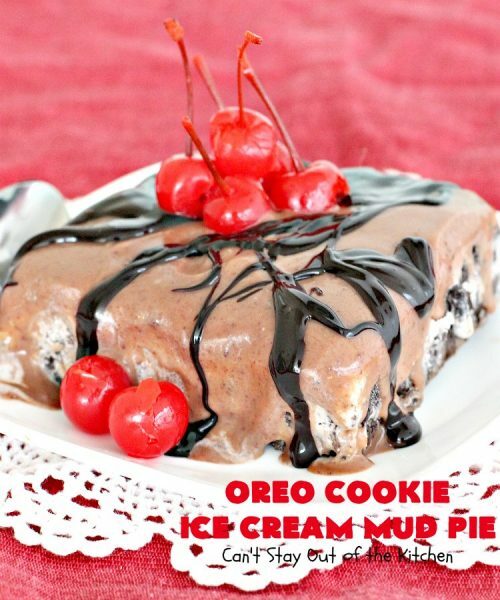 Oreo Cookie Ice Cream Mud Pie is one of the most awesome desserts you will ever eat. If you take extra care it will turn out delightfully. Oreo Cookie crust, Oreo Cookie ice cream, Ghirardelli chocolate sauce = triple yum! 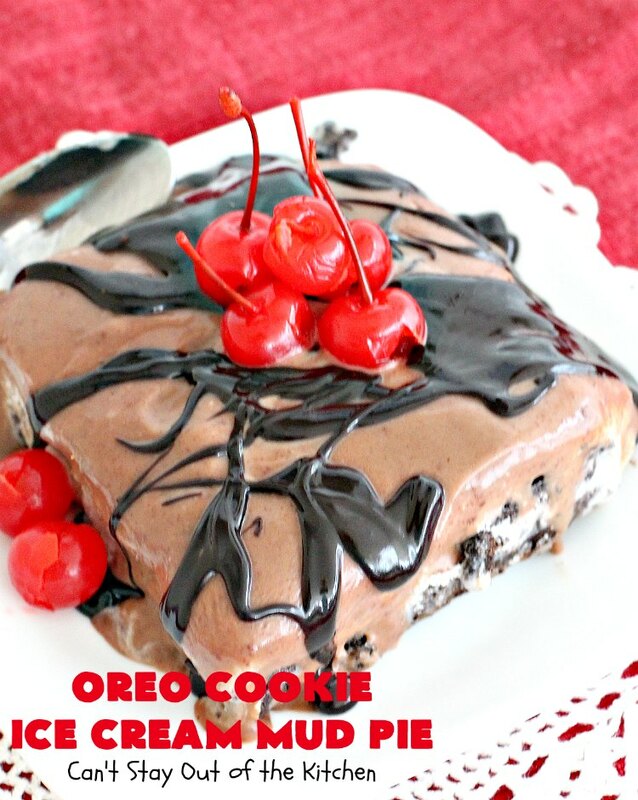 Drizzle Oreo Cookie Ice Cream Mud Pie with a little dark chocolate syrup and garnish with maraschino cherries for a heavenly dessert that’s perfect for any holiday. You can also garnish this dessert with whipped cream and maraschino cherries. 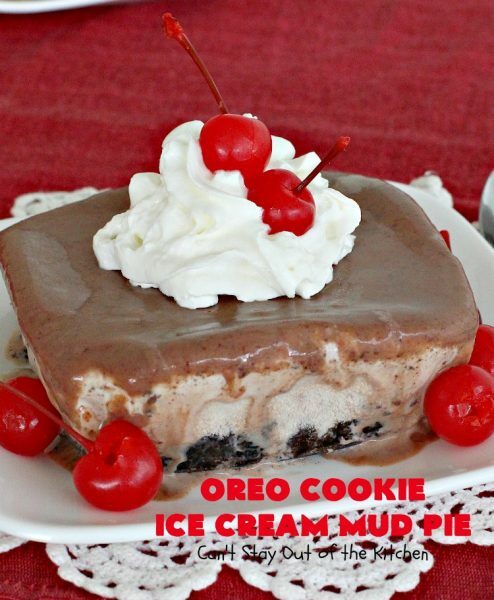 This is the perfect ice cream dessert for Valentine’s Day or Christmas. Place oreo cookies in a zip lock bag. Roll oreo cookies with a rolling pin until finely crushed. Once crushed, place cookie crumbs in a small bowl. You will probably have to use a knife to scrape out all the cream filling from the bag. Add melted butter and stir to combine. 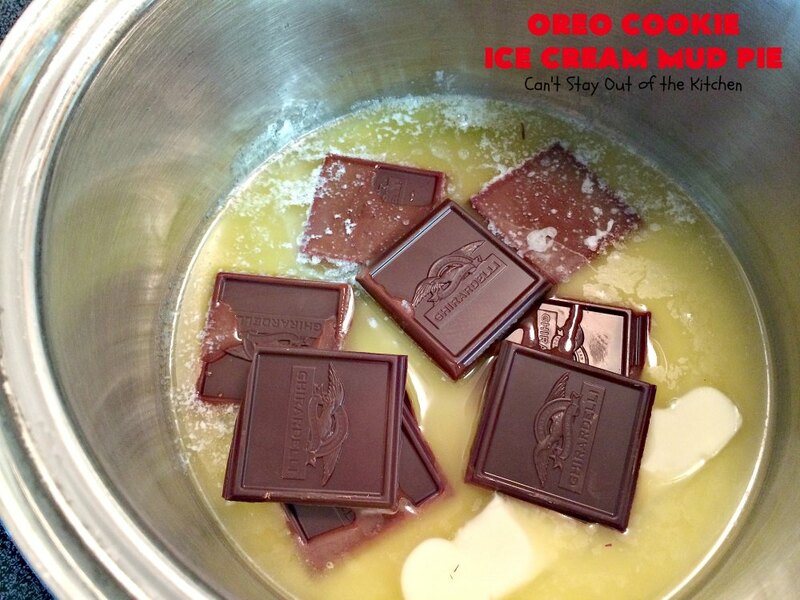 Press oreo cookie mixture into 9×13″ glass baking dish or pan. 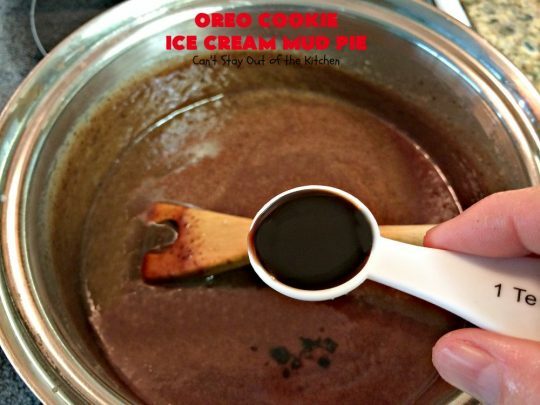 Place oreo cookie crust in the freezer to freeze. Freeze at least an hour. Meanwhile, set out ice cream to soften. Once the ice cream gets soft enough — probably about 45 minutes or an hour, spread softened ice cream over frozen Oreo cookie crust. Freeze at least a couple of hours or until set. (Allow to freeze in your freezer without covering the dessert). Make Chocolate sauce: Place heavy whipping cream in a saucepan and heat over low to medium heat and scald. The cream is scalded when you start seeing wrinkles and bubbles on top of the surface. But use a low enough heat that the mixture does not boil. Add chocolate and stir until chocolate melts. Add melted butter, and sugar. Allow sauce to cook slowly over low to medium-low heat until mixture thickens. This is never shorter than 20 minutes. I cooked mine about 30-35 minutes. Stir occasionally. Here the sauce has thickened. Remove sauce pan from heat. Add vanilla and stir to combine. Allow chocolate sauce to cool COMPLETELY! Once sauce gets to room temperature, put the saucepan in your refrigerator, uncovered, until it gets cold but the sauce is still spreadable. Stir occasionally. Don’t spread the sauce on the ice cream until it is good and cold or the ice cream melts and you will have a mess on your hands. After a few hours of the chocolate sauce cooling in the refrigerator and the ice cream layer freezing in the freezer, the sauce is ready to be spread on top. Spread chocolate sauce over frozen ice cream and smooth to sides. Refreeze, uncovered, for at least 2-3 hours. Cover very carefully with foil, being sure that the foil does not sink into the chocolate sauce and mar the texture. Keep dessert frozen until ready to serve. 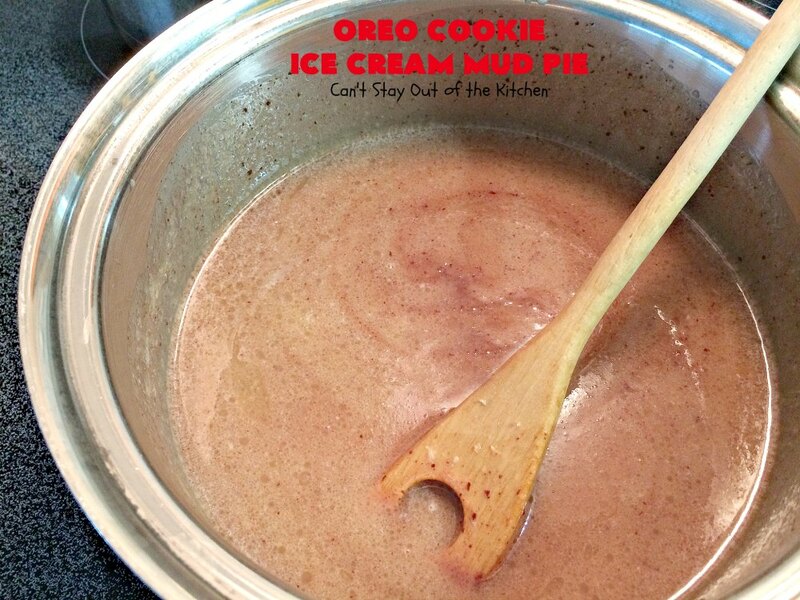 Let Oreo Cookie Ice Cream Mud Pie sit out on counter a couple of minutes before serving. 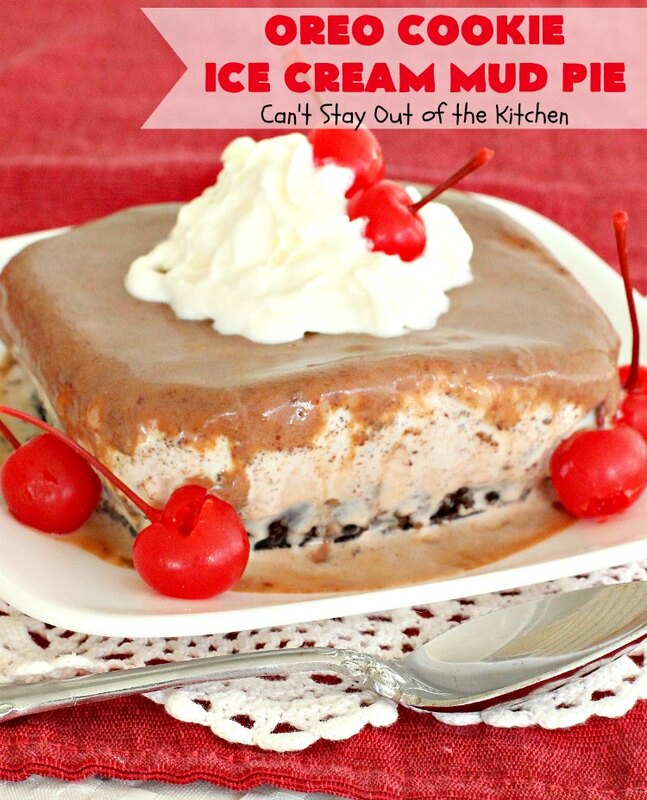 We served Oreo Cookie Ice Cream Mud Pie with Hershey’s dark-roast syrup. This is the most delicious chocolate dessert you will ever eat! Chocolate, chocolate and more chocolate! I guarantee you’ll be drooling after the first bite. This spectacular Oreo dessert has an Oreo cookie crust, Oreo cookie ice cream, and a homemade Ghirardelli chocolate sauce poured on top. Serve with Hershey's dark chocolate syrup, maraschino cherries and whipped cream, if desired. 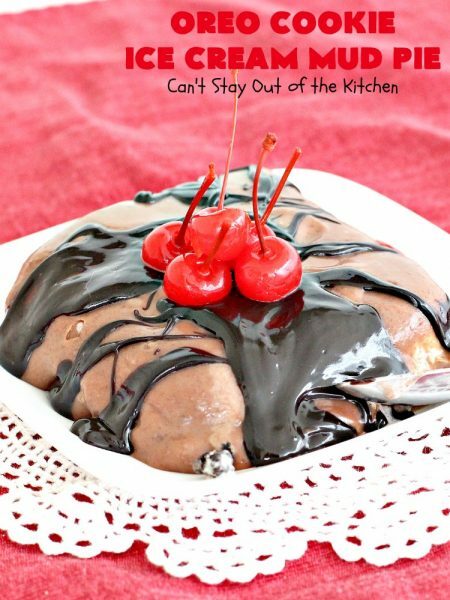 This is a fantastic holiday dessert - especially for Christmas or Valentine's Day. Crush cookies very finely with a rolling pin in a zip lock bag. Place crumbs in a small mixing bowl. Add 5 tbsp. melted butter and mix well. You will probably have to scrape out the cream filling with a knife. Spread into a very generously greased 9x13” pan. This will take between 45 minutes to an hour. Spoon ice cream onto frozen crust. Refreeze until hard. (Do not cover dessert while freezing). To make sauce: place heavy whipping cream in a small saucepan over low heat. Stir until mixture thickens—approximately 15-20 minutes. (Mine probably cooked about 30-35 minutes). Remove from heat and cool about 5 minutes. Allow sauce to cool to room temperature, then put it in the refrigerator (uncovered until it gets really cold but is still spreadable. Stir occasionally with a spoon. 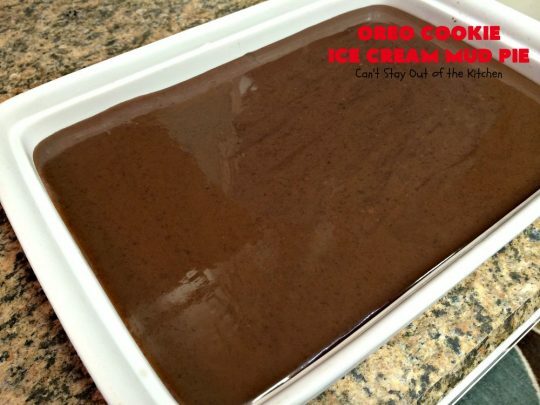 It may take an hour or two to get the chocolate sauce cold enough to spread over the ice cream layer without the ice cream melting and making a mess. Spread cold sauce over ice cream. Refreeze a few hours before carefully covering with foil. Remove from freezer about 5-10 minutes before ready to serve. NOTE: Preparation time does not include time necessary to freeze dessert. NOTE: I have never had the sauce thicken in less than 20 minutes. It usually takes closer to 35 minutes to thicken appropriately while cooking at such a low temperature. 1) If you use margarine or milk rather than real unsalted butter and heavy whipping cream, the sauce will not thicken the way it's supposed to so it will turn out watery. Don't use cheap substitutes. 5) Don't be in a rush to get this dessert made. If you don't have time to allow it to freeze between layers, make it for a time when you aren't busy or plan ahead. This is fine making it a day or two before you need it. 5) Allow the top chocolate layer to freeze completely several hours before adding any kind of foil or wrap, or it will stick to the wrap and make a mess. I recommend making this dessert in a deep dish pan so that when you are ready to put plastic wrap over top it, the plastic wrap will not sink into the dessert and cause the dessert to stick to the wrap. Foil actually works better than plastic wrap for this dessert because it won't sink into the topping. Trust me on this. There's nothing worse than spending all your time making a dessert and then the wrap ruins the topping so it doesn't look pretty. You can also make this in a baking dish or pan that comes with a lid. 6) Do not cover the dessert while freezing each layer, until the finished dessert has been in the freezer for several hours. See note above. 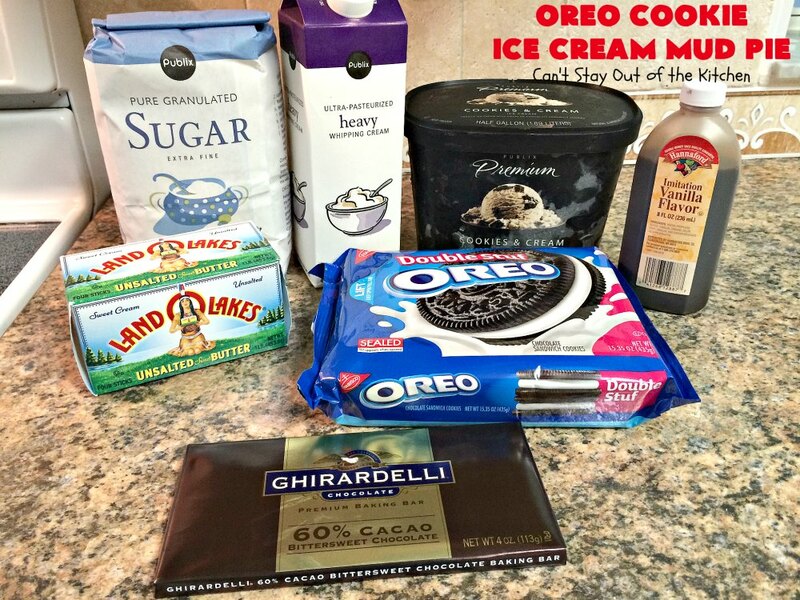 This spectacular Oreo dessert has an [url href=”http://www.oreo.com/default.aspx” target=”_blank” title=”oreo”]Oreo[/url] cookie crust, Oreo cookie ice cream, and a homemade [url href=”http://www.ghirardelli.com/” target=”_blank” title=”ghirardelli”]Ghirardelli [/url]chocolate sauce poured on top. Serve with Hershey’s chocolate sauce maraschino cherries and whipped cream, if desired. Spread into a very generously greased 9×13” pan. Preparation time does not include time necessary to freeze dessert.[br][br]! [b]SPECIAL TIPS FOR MAKING THIS DESSERT:[/b][br][br]1) If you use margarine or milk rather than real unsalted butter and heavy whipping cream, the sauce will not thicken the way it’s supposed to so it will turn out watery. Don’t use cheap substitutes. [br][br]2) It is imperative that you freeze each layer of the dessert before adding the next layer. (Freeze each layer [u]uncovered[/u]). [br][br]3) Freeze the Oreo cookie layer at least an hour. 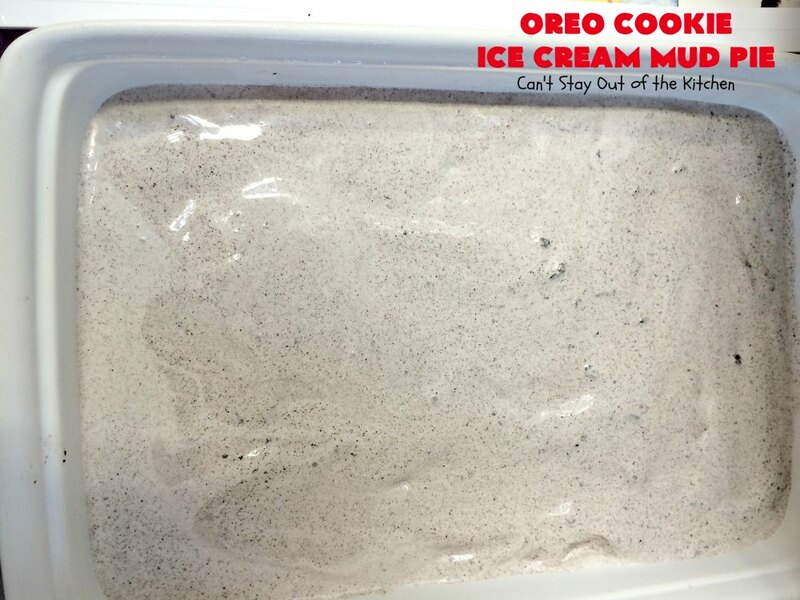 Freeze the Oreo ice cream layer at least two to three hours. Cool the sauce in the refrigerator (stirring occasionally) until it is really cold but still spreadable (not frozen), so that when you spread it over top of the ice cream, it will not melt the ice cream making blotchy bubbles all over the dessert. Freeze the dessert an additional couple of hours or overnight before serving. [br][br]4) Use a high quality chocolate to make the sauce. I used Ghirardelli. [br][br]5) Don’t be in a rush to get this dessert made. If you don’t have time to allow it to freeze between layers, make it for a time when you aren’t busy or plan ahead. This is fine making it a day or two before you need it. [br][br]5) Allow the top chocolate layer to freeze completely several hours before adding any kind of foil or wrap, or it will stick to the wrap and make a mess. I recommend making this dessert in a deep dish pan so that when you are ready to put wrap over top it will not sink into the dessert and cause it to stick. Foil actually works better than plastic wrap for this dessert because it won’t sink into the topping. Trust me on this. There’s nothing worse than spending all your time making a dessert and then the wrap ruin the topping so it doesn’t look pretty. You can also make this in a baking dish or pan that comes with a lid. [br][br]6) Do not cover the dessert while freezing each layer, until the finished dessert has been in the freezer for several hours. See note above. 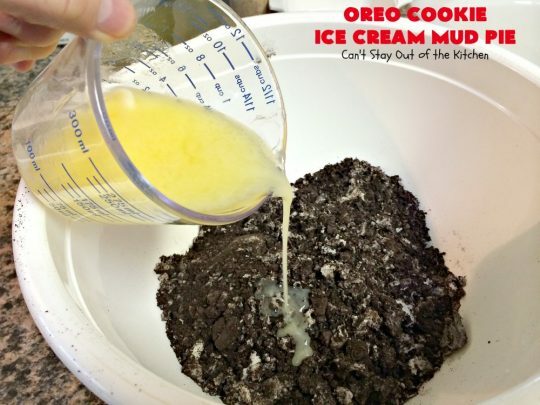 [br][br]7) Grease your baking dish very generously before adding the Oreo cookie crumbs so the mixture will come out of the dish well and without sticking. [br][br]8) When making the sauce be very careful not to cook it higher than a low to a medium-low temperature or the chocolate will scorch and you will have to throw it out and start over! 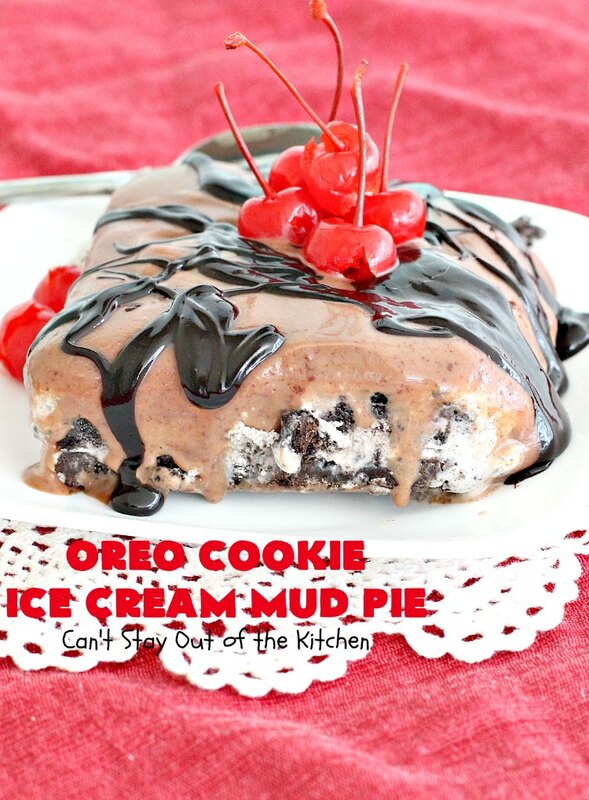 If you enjoy ice cream desserts you will love Oreo Cookie Ice Cream Mud Pie. This dessert is seriously addictive. Oreo Cookie Ice Cream Mud Pie is so sensational, words can’t adequately express how fantastic it is! If you’re looking for a terrific dessert for the holidays, this is it! This turned out wonderfully! I made it for my dad’s birthday. Since I was in a hurry I took advantage of the cold weather and cooled my sauce outside! I set the pan in the snow and stirred it with a whisk. Maybe it was that factor that my sauce nice and thick. Love it! I’m so glad it turned out well for you. I love the taste of this rich dessert. It’s really amazing. Oh, this one is killing me. YUM! This is SO easy Cindy. Consider making this some time for company. 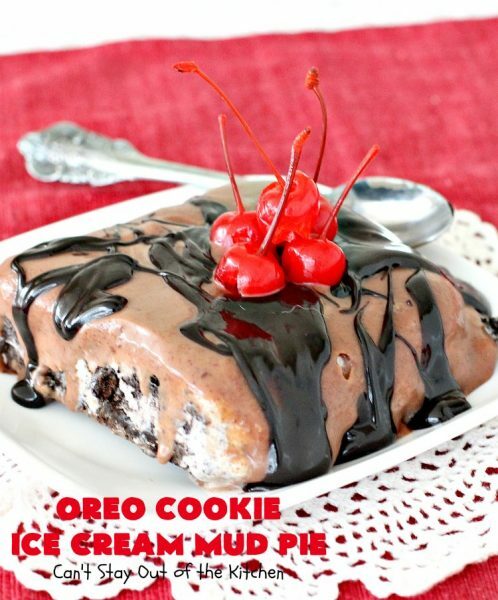 It’s a wonderful dessert and not too difficult. Another nice thing is you can pull it out of the freezer and it’s ready to cut in a minute or two. Not like some ice cream desserts that you have to fight with the knife to cut! !